Whether you are looking to create an outdoor entertaining area, or want to create raised levels and structure in your garden, decking is a great choice. 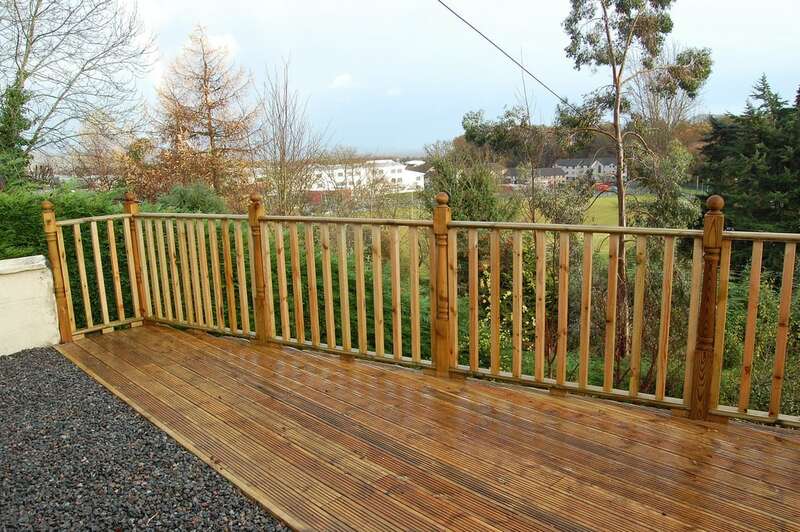 Attractive and practical, decking supplied by Frank Key is a great landscaping option for outdoor spaces of any size. It’s essential to do your preparation before beginning your decking project – whether you’re starting from scratch or are updating what you have currently. So check out our step-by-step guide to building a timber deck. As with any DIY project, good preparation is the key to doing a good job. When installing decking there are a few things you need to think about to make sure your project is a successful one. First, be sure to check with your local council that your new decking plans comply with Building Regulations. The last thing you want is to have to take down your decking after all that hard work. 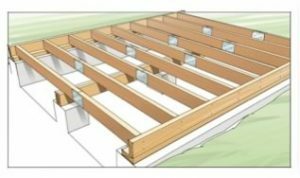 You should also check for the location of any inspection covers or pipework beneath the planned area as decking will make these hard to access once complete. Once approval has been received, begin planning the area. Measure the length and width of your site and place posts at each corner as a marker. It’s important to take your time with this step to ensure you get the correct measurements. Run string lines along the edges of your chosen decking area. This makes sure that the posts you previously placed are all in line with each other in order to get a straight and level deck. Grab a spade and dig up any turf inside the desired area. If your desired deck stretches more than 1.8m, then it will require a bearer – solid pieces of timber that bear most of the weight from the decking. This will ensure that your finished deck is safe and sturdy. Ensure that the frame is supported and rests flat on the ground. If you notice any hollow areas under the frame, adjust the ground level by packing soil beneath the frame to prevent the deck being springy. Hold the frames in place and join together at each corner using two external grade 150mm screws. Use your spirit level to ensure each frame lays equal. It’s best to place markers on the frame before fitting the intermediate bearers. Use the same 150mm screws as used in the previous step to fix them in place. Decking bearers in place, it’s time to start laying the actual decking itself. Take your time to ensure this step is done precisely as this is this most visible part of the deck. Beginning at one end, lay your decking across the intermediate bearers, securing each one with galvanised screws. You should also make sure you pre-drill your decking boards to prevent them from cracking or splitting. It’s also a good idea to use a nail punch when fixing the decking, as this makes sure that the nails get under the timber surface. 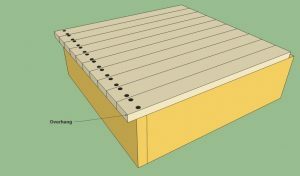 Lay the decking so that it leaves a slight overhang at the end (see image). This will make things easier when it comes to finishing the edges. As you go along, use a small piece of wood or a bullet head nail as a spacer between the decking (see image). This ensures that you get a consistent, tidy finish. Once you’ve laid all of your decking, take your string line and use it to mark out the wood that overhangs the edges. Use a saw to cut along the string line and get rid of the excess decking. So now that you know what to do, there’s nothing stopping you building a deck in your own garden. 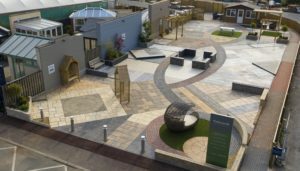 Contact our landscaping supplies department today and we’ll help you choose the right decking materials for your garden.